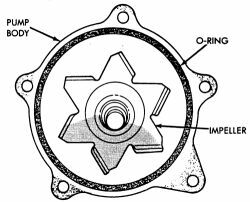 Do I need to pull the crank shaft to remove the timing cover plate? I drive a 1997 Dodge Caravan 3.0 6 cylinder van. I have a Chiltons book but I'am an amatuer and need really detailed pictures on how to remave an reassemble the water pump and the Chiltons book only has one picture of the water pump. Can anyone help? Note: The water pump is timing belt driven in the 3.0 and not as DIY friendly as some. Consider replacing T-belt with the job also. Remove the drive belts. Remove the timing belt covers and the timing belt. Remove the water pump mounting bolts. Separate the water pump from the water inlet pipe and remove the water pump. 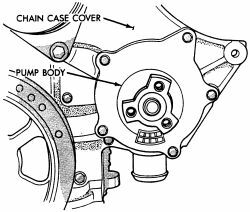 Inspect the water pump and replace as necessary. Clean all gasket and O-ring surfaces on the water pump and water pipe inlet tube. Wet a new O-ring with water and install it on the water inlet pipe. 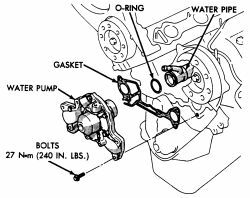 Install a new gasket on the water pump. Install the pump inlet opening over the water pipe and press until the pipe is completely inserted into the pump housing. Install the water pump-to-block mounting bolts and tighten to 20 ft. lbs. (27 Nm). Install the timing belt and timing belt covers. Install and adjust the drive belts. Reconnect the negative battery cable. Fill the cooling system to the proper level with a 50/50 mixture of clean, ethylene glycol antifreeze and water. Run the engine and check for leaks. Top off the coolant level, if necessary. Raise and safely support the vehicle. Remove the right front wheel and lower fender shield. Remove the five mounting bolts and remove the pump from the engine. Discard the O-ring. Clean the O-ring sealing surface and inspect the water pump for damage, cracks, seal leaks, and loose or rough turning bearings. Install a new O-ring into the water pump groove. Install the pump onto the engine. Tighten the mounting bolts to 108 inch lbs. (12 Nm). Install the water pump pulley. Tighten the water pump pulley bolts to 20 ft. lbs. (28 Nm). Install the fender shield and wheel. Tighten the wheel lug nuts, in sequence, to 95 ft. lbs. (129 Nm). Lower the vehicle. Refill the cooling system to the correct level with a 50/50 mixture of clean, ethylene glycol antifreeze and water. Bleed the cooling system. Reconnect the negative battery cable, run the vehicle until the thermostat opens, fill the overflow tank and check for leaks. Once the vehicle has cooled, recheck the coolant level. Agree with Tom,this is definitely not a beginner job with no timing belt/engine experience. The Camshafts will move when installing the timing belt.If this isnt noted and the Timing marks are not correct,ENGINE DAMAGE WILL OCCUR!! Crankshaft doesnt need to be removed but the crank pulleys and harmonic balancer do.